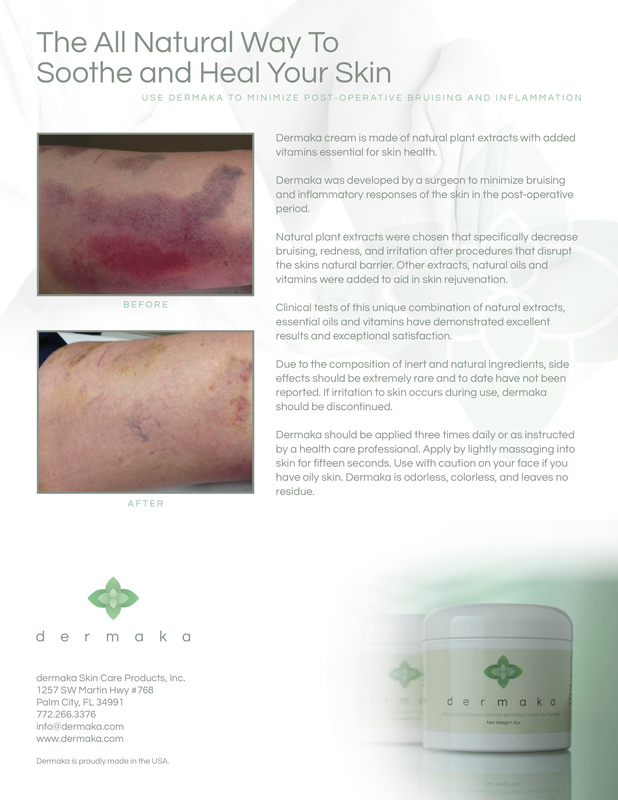 Have you tried Dermaka? 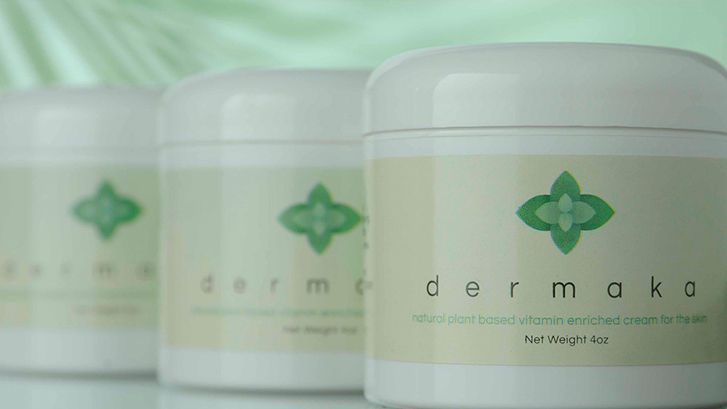 It’s made of natural plant extracts with added vitamins for skin health. This cream minimizes bruising, inflammation, redness, and/or swelling – great for after a vein procedure! Available at North Shore Vein Center. Call 516-869-8346 for more details! Varicose veins are described as large, raised, swollen blood vessels that develop in the legs and can be seen through the skin. They can twist and turn up and down the legs, and are unsightly and embarrassing. According to www.webmd.com, spider veins are smaller red, purple, and blue vessels that also twist and turn. Spider veins are also visible through the skin, and are typically found on the face, as well as on the legs. The main differences between the two are the size and visibility of the veins, and the fact that spider veins can also be found on the face. Both women and men can develop varicose and spider veins, but they’re prevalent in women. Heredity, obesity, hormonal influences, and a history of blood clots can play a part in the appearance and severity of these veins. Occupations that involve long periods of standing, such as nursing, hairstyling, and teaching, can have an impact, according to the website. Other reported causes can include the use of birth control pills, postmenopausal hormone replacement, and trauma or injury to the skin. Facial spider veins can be caused by environmental damage, such as excessive exposure to sun or extreme cold. Treatments are available for varicose and spider veins. The conservative approaches involve the use of compression stockings, or even support hose for minor cases, and basic lifestyle changes. Taking care of your skin (sunblock, moisturizer, and avoiding extreme weather conditions), losing weight if needed, and regular exercise can help treat or avoid varicose and spider veins. If these changes aren’t enough, sclerotherapy is a procedure that involves an injection of a liquid chemical into the vein to cause it to disappear gradually. It is a simple, relatively inexpensive option and can be done on an outpatient basis. Laser and pulsed light therapy, radiofrequency treatments, and surgery are other options. Older adults should consider the health of their veins. Paying attention to venous health is an important aspect of successful aging – and one that has historically gone untreated. Venous insufficiency occurs when healthy veins become damaged and allow the backward flow of blood into the lower extremities. This pooling of blood can lead to a feeling of heaviness and/or aching and can cause skin changes, such as spider veins or a brown, woody appearance of the lower legs. Seniors’ veins respond differently to everyday stress compared to that of a younger person’s because vein walls are primarily made of collagen. As the body ages, a decrease in the production of collagen causes the veins to become more brittle and the values more likely to fail, especially in the superficial veins. Thus, there is a higher incidence of varicose veins in the elderly population. Additionally, the skin begins to lose its elasticity and doesn’t respond to stress the way it once did And because skin is the “end organ” of venous disease, ulcers can occur as a result of damaged veins. Because seniors tend to be less active as a result of other medical conditions, such as arthritis or a respiratory issue that makes them less likely to walk or exercise, they’re more likely to become immobile as a result of a surgery or injury (such as a knee or hip replacement). Some seniors think that “vein stripping” is the only option. While it was the go-to procedure for many years, treatment for venous disease today is vastly different. Breakthroughs in phlebology and new approaches to treatment involve less time, less pain and they are overwhelmingly successful over the long term when performed by an experienced specialist. The risk-benefit ratio makes treatment an ideal option for seniors. Although seniors have a 50% greater chance of suffering from vein disease, they have the same success with modern treatment options as anyone else. Modern techniques, such as endovenous ablation or ultrasound-guided sclerotherapy, are the most effective solutions for the majority of vein problems. They are minimally invasive, highly successful and are not reserved for the young. Sclerotherapy is used to treat spider veins and varicose veins by injecting a sclerosing agent into the interior of the troublesome vein. This substance causes the vein walls to become sticky and seal shut. The collapsed vein is reabsorbed into local tissue and eventually disappears. There is little risk of complication, and patients often experience an immediate relief of symptoms. Light-assisted sclerotherapy is used to treat smaller veins below the skin’s surface. These reticular veins are responsible for feeding the veins that are visible on the surface of the skin. A small, powerful light illuminates the veins and tissue directly below the patient’s skin, allowing the physician to clearly identify the source of the venous dysfunction and to perform the procedure. Ultrasound-guided sclerotherapy is used for larger, less superficial veins that cannot be seen with transcutaneous illumination (light used to view veins near the surface). Due to proximity of some of these veins to nerves, arteries and other structures, a skilled ultrasound sonographer is critical to the success of this procedure. 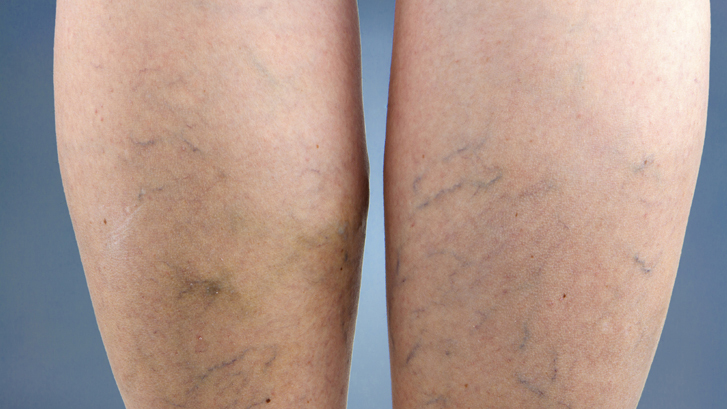 After sclerotherapy, treated veins often fade within a few weeks, although it may take longer to see the full results. In some instances, several sclerotherapy treatments may be necessary. There are several kinds of liquid sclerosing agents. The most popular modern sclerosant is call polidocanol. This is a detergent by nature, and therefore, can form bubbles easily. Foam sclerotherapy is, simply put, the mixture of the liquid sclerosant with a gas to create those bubbles. In the treatment of varicose veins, foaming the sclerosant enables it to displace the blood in larger veins, rather than just mixing with it, as a liquid sclerosant would. That means foam provider a longer contact time between the chemical longer contact time between chemical and the vein wall and is more effective on larger veins, such as the great saphenous vein (GSV) and other truncal veins. Liquid sclerosants work best on the smaller, reticular veins. Another significant advantage of foam is that it is echogenic, which means that it is easily visible on an ultrasound, increasing the accuracy with which individual veins can be treated. In addition, because of the efficacy of the sclerosing agent is increased with foam, a lower concentration can be given to treat varicose veins, which means having a smaller total dose of sclerosant to achieve the desired effect. 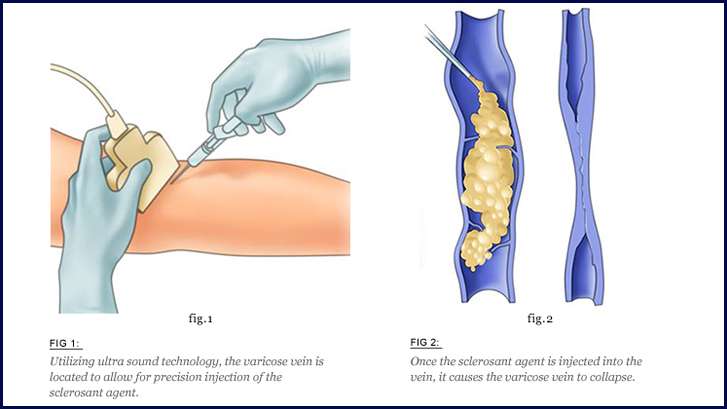 The most common method for producing foam for sclerotherapy is the “Tessari technique”, which involves manually mixing a small volume of liquid sclerosant with a volume of room air or other gas using two syringes and a three-way tap, or stopcock. If you or someone you know is suffering from varicose or spider veins, we encourage you to visit our office for a complimentary vein screening. During this screening, we will go over your medical history, complete a visual exam, review your diagnosis and if needed, recommend a venous ultrasound, which will provide the needed results for your treatment options. Please give us a call if you have any questions or would like to schedule your free screenings. This article was originally published in it’s entirety by Vein Healthcare News and was written by Jennifer Boggs. If you already have a pre-existing venous condition such as venous insufficiency or varicose veins, exercising can be painful! There are some exercises that are more likely to worsen varicose veins as well. It is important to see a specialist regarding any changes or discomfort. Exercise is part of a healthy routine and lifestyle, so rather than avoiding exercise, be smart about how you work out. These types of exercises will help strengthen your legs without a strong risk of developing varicose veins. 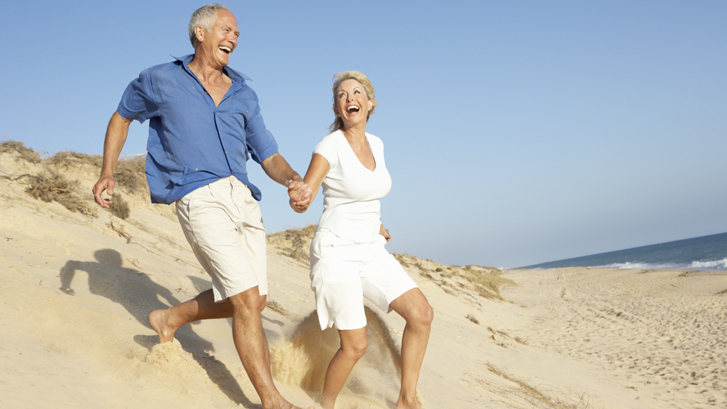 To learn more about Exercising and Varicose Veins, please speak with your vein specialist. Gravity has a huge pull on the formation of varicose veins. Keeping your legs at the same height or higher than your heart during a workout will help to take off the extra pressure that can be put on leg veins during exercising. Many people find breathing more difficult and even strained during physical activity, especially weight lifting. Holding your breath increases your blood pressure, which is horrible for varicose veins. Full and even breaths will help keep your blood pressure more consistent, decreasing the pressure on the veins. Next time you go for a run or hit the gym, don’t forget your compression stockings. These can help strengthen your veins and help to prevent varicose veins. Joe Knapp was 14 years old when he was hit head-on by a car while he was riding a bicycle. The accident fractured his left femur at the proximal one-third of the bone and put him in traction for a week. Femur rodding was a new procedure at the time, but the bone healed quickly and Knapp was able to resume sports like basketball and cross-county running. Fast-forward about ten years. Knapp started to see varicose veins gradually forming on his left ankle and along the scar from the rodding surgery he’d had in high school. At 35, he started to wear knee-high support hose to protect his legs from long shifts as a nurse on a medical-surgical unit. But his leg got worse. Fortunately, Knapp had some training in wound care and knew that all venous ulcers start somewhere, often with symptoms of itching and swelling. In addition, there was a history of lymphedema in Knapp’s family. His mother had Milroy’s disease, a condition characterized by lymphedema in the legs and caused by congenital abnormalities in the lymphatic system. Knapp’s sister also developed swollen ankles in her 30’s, and he also has ankles that swell easily. Knapp’s family history of lymphedema, combined with years of working on a hospital cement tile floors, motivated him to investigate further. And his 2 1/2 years of wound care convinced him to do something about it before it got worse. “I’ve seen what can happen when some people don’t do anything to address the problem,” said Knapp. “The varicose vein can eventually become a venous ulcer, a wound- and wound healing can turn into a long, arduous process.” He added that once the tissue “has had an assault on the system,” it becomes more difficult to repair as the person ages. The presence of varicosities, or even swelling, can exacerbate it. Now, three years later, Knapp is a nurse in a private practice. Because of his vein experience and the care he received, he expresses his concern to the doctor whenever he sees varicose veins or other venous issues, in an effort to treat the problem early and prevent further problems, such as venous ulcers, infections, superficial thromboses and potential bleeding. If you, a friend or a family member suspects varicose veins or other venous issues, we encourage you to come in for a free screening. Proactive Prevention is the best way to keep venous issues under control. 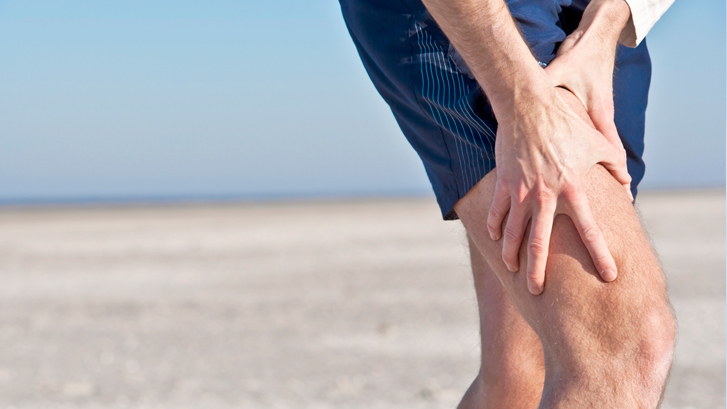 Legs Often Feel Tired or Heavy– These are two of the most common (and early) symptoms of a vein problem. Intense leg fatigue at the end of the day is a sign. Heaviness is usually a result of mild swelling due to poor venous return (blood flow back up to the heart). These symptoms can easily be treated with compression stockings or other minimally invasive therapies. Varicose Veins– Many people discount their bulging veins because they’ve been told for years that varicose veins are cosmetic and not covered by insurance. 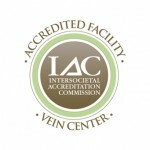 In 1999, the FDA approval of the endovenous approach to vein care changes this dramatically. Today, there are many modern procedures available and, when performed by a skilled phebologist, there is minimal discomfort and great long-term success. “Bad Veins” Run in the Family– Approximately 60% of people who have one first-degree relative with venous issues will also have issues. That statistic shoots to almost 90% if someone has two first-degree relatives with vein problems. If someone has a family history he/she should be proactive about vein disease prevention and consider going to a vein specialist for a baseline evaluation. We offer free vein screenings. Open Sore on One or Both Legs– Though some people suffer from arterial ulcers on diabetic ulcers, the vast majority of leg ulcers have a venous component. Today, more leg ulcers are closer and stay closed because of more effective and focused venous procedures.